Into every generation a Slayer is born: one girl in all the world, a Chosen One. She alone will wield the strength and skill to fight the vampires, demons, and the forces of darkness; to stop the spread of their evil and the swell of their numbers. She is the Slayer. "Don't you ever think about anything besides boys and clothes?" "Saving the world from vampires?" In 1992, Joss Whedon wrote an interesting film with an original concept and a postmodern take on the horror genre. However, due to Whedon's lack of control over his work, he (and several others) saw the film as disappointing, while it did acquire a modest Cult following. Not wanting to let the character and overall concept that he was attached to go to waste, Whedon jumped at the chance to re-visit it on television. In 1997, with an abbreviated first season, Buffy the Vampire Slayer was raised from the dead on the fledgling WB network. At its core was a subversion of the horror movie trope of the fragile and doomed Southern Californian cheerleader attacked by a monster in a dark alley. 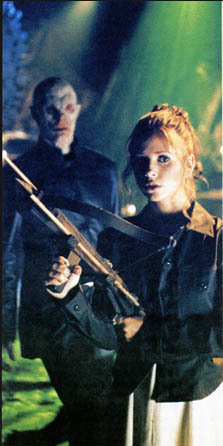 Buffy was snappy, petite, blonde and instead monsters would be afraid of meeting with her in dark alleys. She was part of a long line of "Slayers," one girl every generation given mystical strength and other powers to confront not only vampires but all other sorts of monsters that stalk the night. The TV show took the first movie as originally scripted as Canon, not the film that resulted. After a chaotic and disastrous initial training to hone her abilities, Buffy moved to an isolated city in Southern California called Sunnydale. Initially wanting to escape the responsibilities of being The Slayer, she forms a tight-knit group of friends. An Ancient Conspiracy called "The Watchers Council" has been responsible for training Slayers for millennia, and they sent her a mentor named Giles to prepare her for some nasty things that are going down in Sunnydale, which happens to be the location of a Hellmouth. Joss and his team of merry writers at Mutant Enemy took many standard teenaged issues ("high school is hell", "why is my boyfriend acting weird now that I've slept with him? ", "now we're at college, and all my best friend wants to do is hang out with her boy/girlfriend"...) and explored them with a supernatural, self-knowing, but emotional eye. While the show was not a smash hit at first, critical acclaim was rampant and by the second season a devoted fanbase developed. Part of its success may be attributable to the very clever writing that involved what is now famously named Buffy-Speak (which has its own website). The characters were prone to subvert a wide variety of tropes (being at least partially Genre Savvy), secondary characters were well fleshed out (and sometimes killed) and there was very clear, deliberate Character Development for everyone. The storyline was also notable for how well-planned out the stories were; most every season had a hint toward the events planned for the next season and sometimes major plot points were foreshadowed several years in advance. In 1999, Buffy's Love Interest Angel was spun off into his own series set in nearby LA. Crossovers and cross-references between the two shows persisted until Buffy ended in 2003. In many ways Angel provides a contrast to the themes of its parent series, as it was about dealing with adult life and past mistakes in comparison to the "growing up is hard" notes hit by Buffy over its seven season span. In 2007, "Season Eight" began, a series of comics produced by Joss Whedon and declared as official series Canon. The first issues of a "Season Nine" began in the fall of 2011, split between two series: Buffy the Vampire Slayer and Angel and Faith. The influence of this show on later TV, within its genre and elsewhere, is plain to see. Modern Myth Arc and Story Arc based television owe at least some inspiration to this series, especially the Half Arc Season, as well as the "superhero with high school problems" theme. As several commentators have observed, Russell T. Davies had at least one eye on this show when he revived Doctor Who. This series is one of the single most Trope Overdosed and Lampshade Hanging shows in existence with over 5500 references strewn across this wiki. This is partially because TV Tropes originally began with a focus on Buffy (based on a 2004 thread on the fan site Buffistas.org) before branching out to all of TV and eventually all of everything. There are plans to revive the franchise as a film without the involvement of Joss Whedon, the reason being the makers of the original movie had retained the rights all throughout the show's run, even though they had no creative involvement since. This has been remarked upon by cast members as generally a bad idea. Some episode-specific tropes can be found on the recap page.